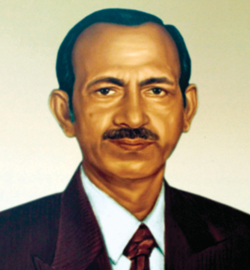 M S Krishna Bhat, former Chairman of Karnataka Bank passes away. Mangaluru, June 10: M.S. Krishna Bhat, former Chairman of Karnataka Bank passed away on Friday, June 10th , 2016 at the age of 78. M S Krishna Bhat, joined Karnataka Bank in 1970. He was elevated to the position of General Manager in 1989 & later became the Chief General Manager in 1994. He took over the reins of the Bank as Chairman on 12.07.1995 initially for a 2 year period which was extended for another 3 years upto 11.07.2000. Karnataka Bank witnessed new highs under his able leadership and the Bank’s capital expansion programme, in October 1995, by way of public issue of Bank’s shares at a premium, received overwhelming response from investors even in the midst of adverse market conditions. He was known for his straight-forwardness, foresight, and quick decision-taking capacity. During his tenure as the Bank’s Chairman, the paid-capital and owned funds of the Bank increased multifold. The total business of the Bank also more than tripled, registering a growth rate much higher than the industry growth rate. The Bank also secured the highest P1+ rating for its Certificate of Deposits from CRISIL. The Bank also ventured into leasing and Hire purchase business. Computerization of banking operations were initiated in the Bank during his tenure as the Bank’s Chairman. In the passing away of M.S. Krishna Bhat, Karnataka Bank has lost a great leader, friend and well wisher. While paying tributes to the departed soul, the Bank places on record M.S. Krishna Bhat’s contribution towards the growth of the Bank. RIP. May the eternal soul rest in peace. A person of great achievement is no more but will always remain i the hearts. Condolence to all the family. May the eternal Soul Rest in Peace.Our achievements will always remind of you Sir.